Welcome to the book section of my website. 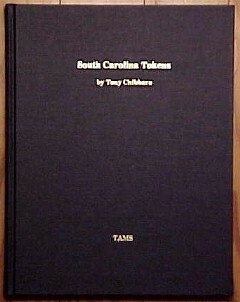 Here I am offering several reference works on South Carolina tokens that I have completed in the past few years. 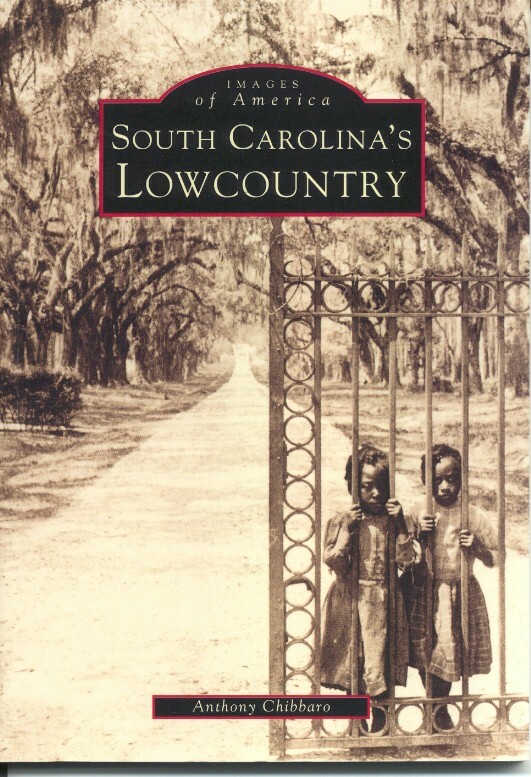 Also offered is my recent book featuring images from Lowcountry stereoviews, as well as a book on the Charleston Exposition. These last two works are not reference books, but more "pleasure" reads. Used books may be offered from time to time. Check out the more complete descriptions below. 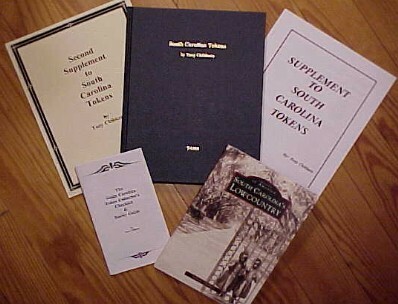 South Carolina Tokens by Tony Chibbaro - The standard reference in its field, published by the Token and Medal Society in 1990. Hardback, large size (8x11), 262 pages on acid-free paper, the reference lists some 1800 trade and merchant tokens issued in the state of South Carolina from the early 1800s to modern times. Includes a nice introduction, a short history of token use in South Carolina, and also an index of all token issuers (not just maverick tokens). Approximately 750 tokens are pictured (1500+ individual b&w photos), along with many photographs showing town scenes and the business which issued the tokens. Historical information is included on almost every issuer along with a rarity rating for every token. All in all a fine quality reference work. Received a silver Mishler Cataloging Medal in 1990 awarded by the Token and Medal Society. Click here for photo of book or sample page. Price: $50.00 postpaid. 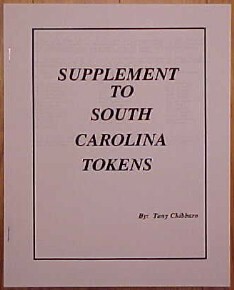 Supplement to South Carolina Tokens by Tony Chibbaro - Designed to be a companion reference to the book above, this supplement lists some 200 tokens discovered from 1990 (when South Carolina Tokens was written) to September 1994. Softbound, large size (8x11), 24 pages, self-published. Approximately 90 of the 200 tokens are illustrated by quality rubbings. Historical information and rarity ratings are provided in the same format as the original work. Click here for photo of the cover. Price: $6.00 postpaid. 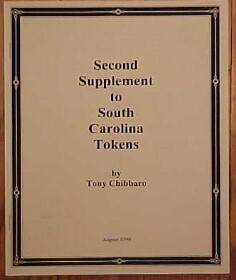 Second Supplement to South Carolina Tokens by Tony Chibbaro - The passage of time brings forth many new tokens, and these need to be cataloged also. The second supplement lists another 200 tokens, discovered since the fall of 1994. Brand new, softbound, large size (8X11), 31 pages, self-published. Approximately 110 tokens are illustrated by quality rubbings. Historical information and rarity ratings are again provided. Click here for photo of the cover. Price: $7.00 postpaid. 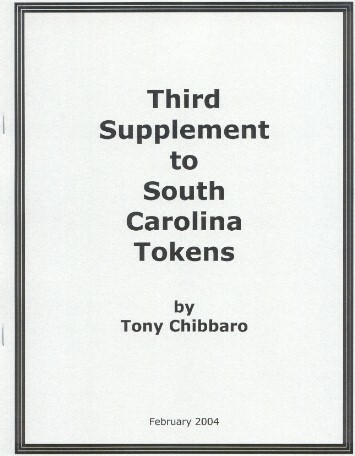 Third Supplement to South Carolina Tokens by Tony Chibbaro - Published in February of 2004, this work lists all new tokens discovered since the printing of the Second Supplement. Includes approximately 250 new listings (140 of which are illustrated), historical information, and rarity ratings. 36 pages, large size (8x11), softbound. Click here for photo of the cover. Price: $8.00 postpaid. 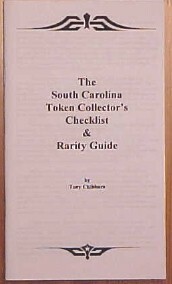 The South Carolina Token Collector's Checklist and Rarity Guide by Tony Chibbaro - A handy pocket-sized checklist, ideal for keeping track of your collection and carrying around to shows. No pictures or historical information, but each token listed along with rarity information. Softbound, 60 pages. Click here for photo of the cover. Price: $9.00 postpaid. Known for its unique beauty and complex history, the Lowcountry is one of the South's, and the country's, most fascinating regions. A wonderful blend of picturesque coastlines, expansive marshes, mysterious swamps, and verdant landscapes, the Lowcountry has played a vital role in our nation's history............... Author and amateur historian Anthony Chibbaro has collected a wide array of stereoviews for South Carolina's Lowcountry, capturing the area's natural beauty and extraordinary charm, in both its architecture and its people. These images, matched with the book's informative captions, create an incredible reading experience, one which will surely be a treasure to those who have grown up in the Lowcountry and to its many visitors who come each year to experience this special Southern place. Softbound, 6x9, 128 pages. Over 200 special images of the Lowcountry have been reproduced from vintage stereoviews, showing life as it was in the Charleston area over 100 years ago. Many, many views from Civil War Charleston and Beaufort, showing both Confederate and Union troops, including the very first photograph taken of an actual ongoing battle (taken by George S. Cook from the parapet of Fort Sumter in 1863). Click here for photo of the cover. Price: $20.00 postpaid. From December 1901 to May 1902, the City of Charleston, South Carolina, hosted the only world's fair ever held on Palmetto State soil. Officially known as the South Carolina Interstate and West Indian Exposition, the event was eagerly anticipated by Charlestonians in hopes that it would boost business and industry. Even an unusually cold winter could not deter the 675,000 people who visited this landmark celebration in South Carolina history........ South Carolina historian and author Anthony Chibbaro, an aficionado of photographs, postcards, and other collectibles, has researched and compiled this fascination pictorial history in honor of the Charleston Exposition's centennial. 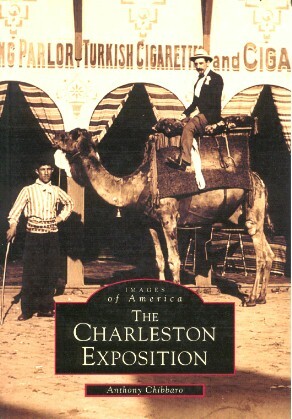 With rare views of the fair itself, as well as of the patrons and their keepsakes, The Charleston Exposition will intrigue South Carolinians, fair-lovers, and anyone else who finds a connection with events of the past. Softbound, 6x9, 128 pages. Click here for photo of the cover. Price: $20.00 postpaid. 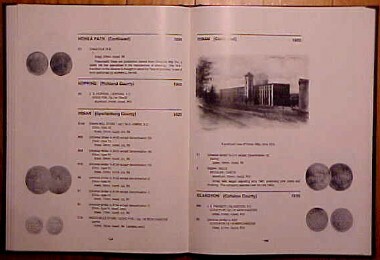 4 Successive Issues of TAMS Journals, 1977, comprising issues of April, June, August, and October 1977. In the early 1970s, a collector named Randy Chambers compiled the first listing of South Carolina Tokens. In 1977 his list was published in serial form by the Token and Medal Society in its bimonthly journals. Offered here is the complete set of the four issues. Some of the historical information about South Carolina tokens in these articles is not included in the references offered above. Set of four issues, all vf copies. Price: $22.00 postpaid. To order any of the above books, please email me at chibbaro@mindspring.com or use the email link at the bottom of this web page. Let me know which items you wish to purchase and I will respond with mailing instructions and total amount due. Order with confidence, I have over 15 years experience in dealing with collectibles and their associated books. All book orders send postpaid. South Carolina residents must add 6% sales tax. Used books are subject to prior sale. I have multiple copies available for all new books.